Locus in Comitatu Ingham. Meridiano-occidentale urbis latus in Eaton Comitatum extenditur. Urbi etiam sunt duo parvi tractus separati in Ingham Comitatu. Hae regiones in tabula non monstrantur. Lansinga (Anglice Lansing) est caput Michiganiae, unius e civitatibus Civitatum Foederatarum. Plerumque in Comitatu Ingham situm est, quamquam regiones urbanae ad occidentem versus in Comitatum Eaton et ad septentriones versus in Comitatum Clinton extenduntur. Lansinga est solum caput civicum Americanum (inter quadraginta septem capita in comitatibus sita) quod sedes comitatus non est. Sedes quidem rectionis Comitatus Ingham est Mason, sed comitatus nonnullas officinas Lansingae habet. Iudicium Maximum Michiganiae, anno 2002 apertum. ↑ "Telephone Directory". Ingham County. 2009 . Balaskovitz, Andy. 2012. 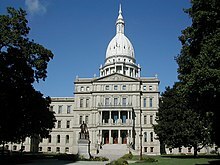 Despite hurdles, consolidating Lansing, East Lansing and Lansing Township makes sense. Lansing City Pulse, 28 Novembris. Apud NewsBank 33658e6f3e435749c466e59bf44dd1b692752. Vicimedia Communia plura habent quae ad Lansingam spectant. Novissima mutatio die 11 Februarii 2019 hora 15:10 facta.